All active duty Navy personnel can be eligible to receive up to $4500 in tuition assistance to attend school. Many of the featured military schools we have listed do not exceed the $250 per semester credit, allowing you to attend school with no out-of-pocket costs. You can earn your degree or certificate online while serving in the Navy. To qualify you must be on active duty during the length of your program that is being paid for using TA, you must receive navy college office counseling and if you are an officer you must remain on active duty for at least 2 years after your last TA funded course. 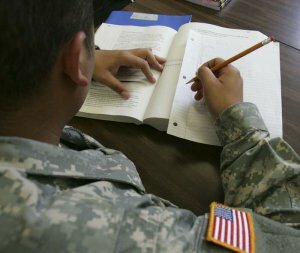 Finding out if you qualify for tuition assistance is easy. The first thing you'll need to do is find a school and program you are interested in. We list 100's of schools by program, many of which are approved military schools. Once you request information from the school to see if the school will be a good fit you'll need to contact the Navy College Office and complete the form NETPDTC 1560 and return it to the Navy College Office. The school you are attending will contact you with all the additional info you need including the start dates and official title of the program you are taking. In additional to the Navy TA funding you and your spouse may be eligible for more educational funding that can be used in the event the tuition cost of the college you are attending is higher than $250 per credit hour. Be sure to ask about the Admiral Mike Boorda loan program, the Vice Admiral E.P. Travers loan program as well as specific scholarships based on what ship you are on. Each program is different and some loans be range from $200 to $3000 per year. If your spouse is interested in furthering her education she should look into MyCAA as well as the Spouse Tuition Aid Program (STAP). These programs can provide funding up to $4000 for her to go to school and receive a portable career education.